For this month, we are excited to have Brandon Jennings as our guest speaker. Brandon is from Winn Parish and is the founder of the Bayou State Crappie Association. 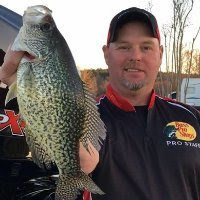 A crappie pro angler, he's a pro staff member for Crappie Psychic lures, NuCanoe kayaks, Trophy Ridge and several other fishing product companies. He's been a featured speaker on crappie fishing at numerous events. Earlier this year, Brandon teamed up wtih the Union Parish Chamber of Commerce to hold the first-ever "Catch A Special Thrill" C.A.S.T. More than 100 folks took part to help a big group of special needs kids enjoy some fishing and boat riding. Brandon will talk about tips and techniques for crappie fishing. Regardless of tackle used, there's a lot to learn about this popular and sometimes elusive species! As always, the meeting is open to the public. 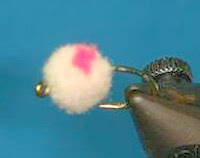 At the May fly tying session, Dan Fromme led the group of 11 tiers in tying the Blood Dot Egg Fly. The name "Blood Dot" could be used to describe the red dot on top the pattern, but it's actually the name of it's creator, Jeff Blood. Blood is a well-known steelhead guru from Pennsylvania who 30 years ago observed that steelhead eggs had a distinct orange marking on one side. While the pattern was created for steelhead, it's been exceptionally good for all species of trout. There are a couple of variations to tying this fly, but here's a video on the technique Dan used (and which doesn't require a special tool). As always, beginners are welcome! If you don't have tying tools, the club has a few sets for use during these sessions. Materials are provided.